The fantasy film genre boasts some great sequels, even when those films are little more than bridges from Episode 1 to 3. While the second born may lack closure, it doesn’t bear the burden of exposition that tends to weigh down any first episode, and it lacks the need to tidy up every minute detail that sometimes derails a final installment. The Empire Strikes Back is the classic example, but the genre offers many others. The Hunger Games sequel, for instance, far surpasses the first. Even the wingnut Peter Jackson’s first Tolkien trilogy offered the swiftly paced and satisfying center, The Two Towers. His next Middle Earth middle child, the beardtastic The Hobbit: The Desolation of Smaug, hits screens this week, and it, too, benefits from a groundwork set in the first installment, and the freedom to end without tidying up. And Arkenstone be damned, Ian McKellen is the gem of this franchise. Once again, he brings the right mix of humor and gravitas to make Gandalf the coolest guy – excuse me, wizard – in the realm. 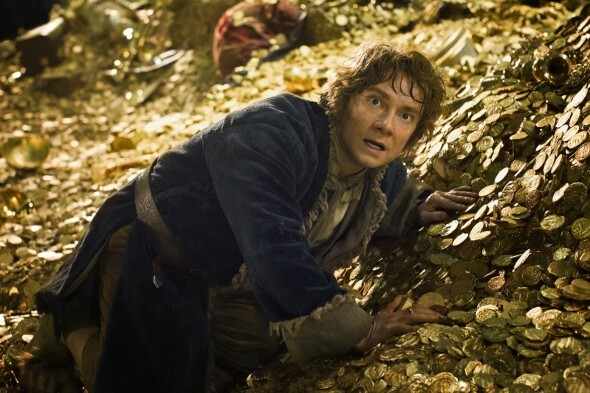 Martin Freeman is also spot-on as Bilbo – a perfect mix of humility, courage, and British manners. His Bilbo is very easy to relate to, which is rarely the case in a Tolkien production. Still, many of the million-ish supporting turns, though universally one-dimensional (regardless of cinematic presentation), animate the tale appropriately. There’s a lot holding it back, though. Mainly, it suffers from the same condition as An Unexpected Journey, which is that there is no defensible reason to make three films out of the novel The Hobbit. The Lord of the Rings was conceived by Tolkien as a trilogy, where The Hobbit is a single volume, so Jackson had to carve it into three, padding and elongating here and there to accomplish this mission. Because if there’s one thing Tolkien needs, it’s more stuff. The needless bloat is an obstacle to enjoying all that’s right about the film, because the story just becomes tedious too soon and too often. The fact that you realize there will be no satisfying conclusion does not make the pace seem any less leaden, and the result feels more like a rip-off than a cliffhanger. Yes, the dragon looks cool, the Orcs continue to frighten, and as a tourist video for New Zealand, the location shooting works miracles. But many filmmakers, Jackson included, have been devoted enough to the stepping-stone sequel to craft a film that succeeds where the rest of the franchise fails. This time around, Jackson just adds filler and cashes checks.